Something has changed. Something is in the wind. - Something is definitely NOT business as usual. 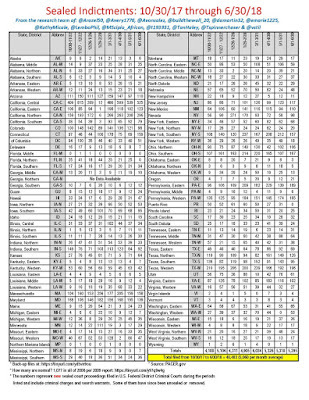 This many NEW sealed indictments (~40,000) nation-wide is far above the usual 1,000 or so. One can only HOPE the jig will soon be up. - But, that said, public hangings would be welcome any old time now. Screw the "public hangings". That's WAY too quick. Wood chipper instead. Feed them through feet first. SLOWLY. Although a properly executed public hanging - heh, I said "executed"! - could be nice. Guinness book of world records! Largest gallows ever. Running the whole length of the National Mall and circling back around on itself. Set up like those domino displays - tripping the first one sets off the second and so on all the way around to the end!!! 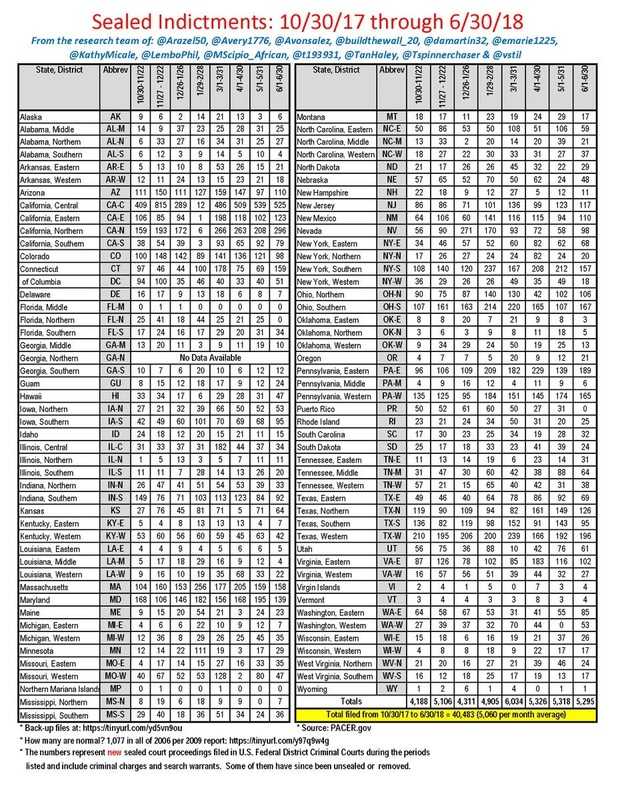 This chart/list that Rico posted of the sealed indictments is from the latest Qanon post. I read this and several other posts last night 7/3/18 a lot of action lately, many things are being done. MSM/CNN will never acknowledge anything negative regarding the cabal. "We have the server" (think Seth Rich) and on page 203 of the IG report is a bombshell, on page 203 there is a note that the US Secret Service for Bill Klinton contacted the Lynch staff to coordinate the meeting for security purposes, that says the Bill Klinton & Loretta Lynch tarmac meeting was "pre-arranged" and that's counter to the official released narrative that the two airplanes just happen by coincidence (there are no coincidences) to be next to each other. After about the 20 minutes into the meeting a senior LL staffer (who said they were blindsided by the meeting) went on board the LL plane (staff was waiting in a van on the tarmac) and broke up the meeting. The white hats are winning.